Two of the three metropolitan areas studied here contain racial and ethnic subpopulations large enough to study on their own—in the case of Denver, those who identify as Hispanic, and in the case of Macon, those who identify as black.26 In both cities, distinct patterns emerge across racial and ethnic divides—some of them overlapping, others unique to their respective metropolitan area. Specifically, the surveys find that blacks in Macon and Hispanics in Denver express a greater interest in local news than do whites, and the local news topics these groups follow differ somewhat from those followed most closely by whites. In addition, blacks and Hispanics express a greater sense of agency when it comes to improving their community, and in Macon, blacks display a greater propensity toward using social media to get news. Hispanics in Denver—comprising 19% of the population—espouse a distinct set of attitudes about their city and local media as well as news behaviors and information preferences compared with the majority white population. In particular, Hispanics are much less likely than whites to say Denver is “an excellent place to live” (38% vs. 55% of whites). At the same time, however, they are more likely to feel a sense of agency in changing that situation, with twice as many (42% vs. 21% of whites) saying they can have a big impact in making their city a better place to live. The Denver metropolitan area supports a number of publications and broadcast outlets that cater directly to Hispanics. Of the 17 ethnic media outlets identified in the metro area by researchers, nine cater specifically to Hispanics and/or Spanish speakers. One of these is The Denver Post’s Spanish-language edition, Viva Colorado. Univision and Telemundo’s local broadcasts, along with a few Spanish-language radio programs, round out the offerings to this community. A snapshot analysis of five days of content in Denver’s ethnic media finds a different focus of coverage from the local mainstream broadcast and print media. Education, religion and immigration were among the most prominent topics covered by the eight outlets—seven of which are aimed at the Hispanic and/or Spanish-speaking community—in the period studied.27 In contrast, immigration was not covered at all in the sample collected for The Denver Post or television outlets, and there was only a single religion-focused story. And while Hispanics in the region gravitate to some of the same broad-interest news outlets turned to by the general population, a range of notable differences emerge in the sources favored by this group. 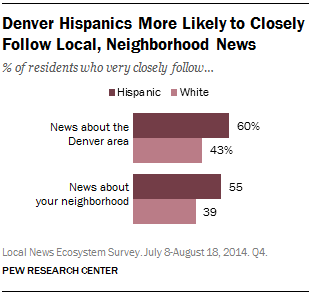 More Denver-area Hispanics closely follow local news than do whites. Six-in-ten Hispanics very closely follow news about the city, and nearly as many (55%) follow news about their neighborhoods very closely, compared with 43% of whites following city news very closely and 39% who say the same for news about their neighborhood. When it comes to specific news topics, Hispanics are notable in their interest in a handful of particular topics: about twice as many Hispanics as whites very closely follow local crime, jobs and education. In addition to some key differences in the local news topics being followed, there are differences in the topics that whites and Hispanics most frequently discuss. Whites are more likely than Hispanics to often discuss four of the 12 topics asked about, including the local economy, businesses and development. Hispanics discuss two local issues at a much higher rate than do whites. Crime is often discussed by 70% of Hispanics, compared with about half (49%) of whites, and jobs and unemployment are discussed by about twice as many Hispanics (45%) as whites (21%). As for the ways that residents interact with local news, sharing a story with someone digitally ranks among the most common practices among both whites and Hispanics in the Denver area. More than half (56%) of whites said they have done this in the past year, somewhat higher than the 45% of Hispanics who reported the same. 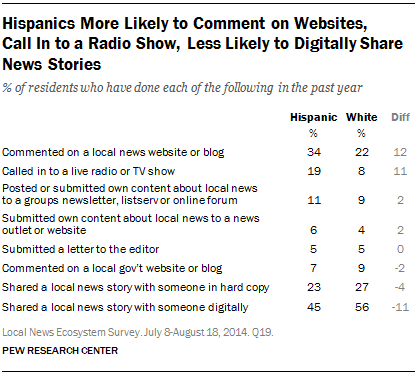 Hispanics, though, are more likely than whites to have commented on a local news website or blog or called in to a live radio or TV show. Roughly four-in-ten residents (41%) in the Greater Macon area identify as non-Hispanic black. 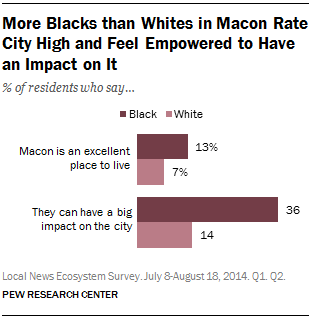 While blacks are nearly twice as likely as whites to rate Macon as “an excellent place to live,” that rating still hovers at a relatively low 13% (compared with 7% for whites). Black residents are also more likely than the white population to feel that they can have a large impact on the city, and they are more engaged in their community as a group. Unlike Denver, where at least nine local news providers cater specifically to Hispanics and/or Spanish speakers, Macon supports a relatively small number of sources aimed at the African-American community. The Georgia Informer, a monthly paper, serves the Macon area. A local commissioner for the county government, Elaine Lucas, hosts a weekly radio program focusing on issues of concern in Macon’s African-American community. And the Macon Black Pages connects the community through its annual business directory and local events e-mail service. The black population in Macon follows local news much more closely than does the white population. 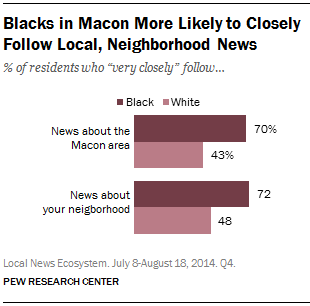 Seven-in-ten blacks say they very closely follow news about the Macon area, compared with just 43% of whites. This large gap also exists for news at the neighborhood level. When it comes to specific local news topics, weather and crime stand out as the two that are followed the most among both groups. Nearly two-thirds of blacks (63%) follow crime very closely, as do 43% of whites. Local weather is followed by more than two-thirds of both blacks (68%) and whites (72%). Overall, a greater proportion of blacks follow nine of the 12 topics asked about—from schools to transit to jobs—at higher rates than whites. Another way in which the black community in Macon demonstrates strong interest in local news is in the news topics they discuss. Twice as many blacks (62%), for instance, report they often discuss local jobs and unemployment as do whites (29%). And more than a third of blacks (37%) often discuss community events, compared with 21% of whites. There are also differences in the types of news sources being used. 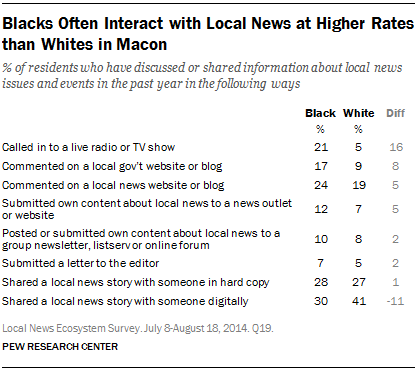 For example, blacks in Macon (74%) are somewhat more likely than whites (61%) to say they often use local TV for news. They are more likely to often turn to other local newspapers or magazines aside from the major daily (13% vs. 6% among whites), to radio (23% vs. 16%), and to nontraditional sources such as local government agencies, neighborhood associations, and other residents in the community. And while the native platforms of these sources (such as the print edition of a newspaper) are still the most prominent among both blacks and whites, blacks are often more likely to access news sources through social media. For example, blacks in the Macon area who get local news from The Telegraph are more likely than whites to access the site via social media (24% vs. 14%). Among consumers of other print publications beside the major daily, blacks are nearly three times as likely to have gotten there via social media than whites (25% vs. 9%). 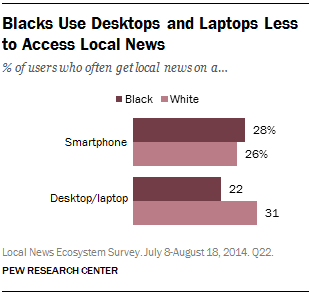 And about twice as many blacks (13%) who get news on local radio access it through social media than do whites (6%). Indeed, while the numbers are small over all, twice as many blacks (12%) as whites (6%) say social media is the most important way they get news about Macon. Whites, who are also more likely to be internet users, are somewhat more likely than blacks (41% vs. 30%) to have shared a local news story with someone digitally in the past year. 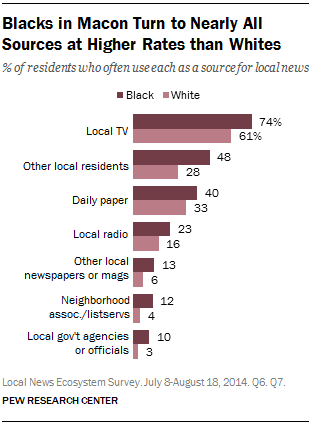 But there are a few ways in which blacks surpass whites when it comes to sharing local news. Blacks, for instance, are more likely than whites to have called in to a live TV or radio show (21% vs. 5%). They are also somewhat more likely to have commented on a local government website or blog (17% vs. 9%) and to have submitted their own content about local news to a news outlet or website (12% vs. 7%).